‘ Sir Robert Peel and a party of fiends were engaged in shooting peasants at Drayton manor ‘. This shurely can’t be a genuine newspaper report. ‘The remains of the late John Payne, collier, were interred yesterday afternoon in the Bray Churchyard, in the presence of a large number of friends and spectators’. Hmmm. Must remember to visit this colliery near Maidenhead. The provincial reporter, who had taken this report from a national newspaper, had evidently never heard of Mr Collier, the notorious Shakespeare forger. In Charlotte Yonge’s Dynevor Terrace (1857 ) a lady is described as being ‘ without stretched arms ‘. On page 389 of the Index to Edmund Blunden’s, Leigh Hunt (1930 ) Thornton Hunt becomes Thornton Heath. Perhaps the indexer lived in south London. In the error- strewn Early Victorian Illustrated Books (2005) by John Buchanan-Brown, Puss in Boots, becomes Puss in Books, which could be a good name for a bookshop. Incidentally, this book was published by the British Library ! In William Derham’s, Life of Ray ( 1760 ) a list of books read by the botanist in 1667 is printed from a letter to a certain Dr Lister. One of the books was about ‘great Rakes ‘ which was interpreted by Derham’s editor, George Scott, as having something to do with agricultural implements. Scott then extrapolated that these were ‘ now come into general use among farmers and are called drag rakes ‘. In reality the work referred to by Ray was concerned with the exploits of Mr Valentine Greatrakes, the infamous quack doctor. Astonishingly, this blunder remained uncorrected in Lankester’s Memorials of John Ray (1846) and was only noticed by Rev Rich Hooper in N & Q seventh ser. iv 225. Old Lights for New Chancels ( from ‘ By the same author ‘ note in 2nd edition of Betjeman’s New Bats in Old Belfries (1945 ). It was the other way around, of course. The error was corrected later. 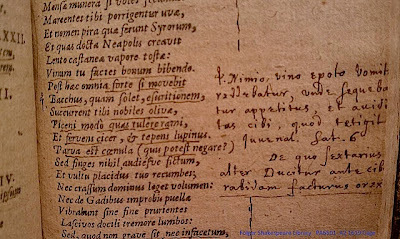 The French lawyer and brilliant amateur mathematician Franciscus Vieta was wealthy enough to finance the publication of his own pioneering treatises, but so meticulous was he that, being discontented with the misprints that had escaped his notice in his Canon Mathematicus (1579) he purchased all the copies he could meet with. Today, the book, like all his other works, has become extremely rare and sought after by modern mathematicians. ‘Pope Sixtus the Fifth’s Vulgate Bible of 1590 so swarmed with errors that paper had to be pasted over some of the erroneous passages, and no-one took seriously the bull prefixed to the first volume which excommunicated any printer who altered the text. A few months later, the Pope died and the College of Cardinals stopped any further sales, and also bought and destroyed as many copies as possible. Back in the mid nineteenth century a copy was sold in France for 1210 Francs. God knows how much one would fetch today. 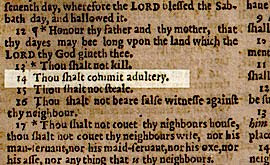 In the ‘Wicked’ Bible of 1631 Thou shalt not commit adultery is rendered as Thou shall commit adultery. This was thought to be unique, but at least six, and possibly a few more, copies are now thought to have survived. One was bought for £25 in 1855, an imperfect copy was sold to the BM not long afterwards, a third was sold to the Bodleian by a Dr Badinel, a fourth is in the Euing Library, Glasgow, a fifth was discovered by Henry J Atkinson of Gunnersbury in 1883 and a sixth was snaffled up in Ireland in 1884. The Great (Bible) Site boasts of having the only copy for sale in the world at a wicked $89,500. 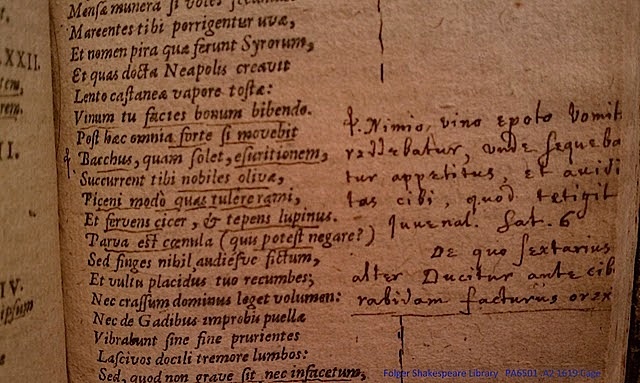 In a Bible of 1634 the first verse of Psalm 14 appears as ‘The fool hath said in his heart there is God ‘. The authorities perhaps did not view this error as particularly dangerous, for there is no evidence that the printer was ever prosecuted. Copies still go for £1,000 or more, however. You would think that the lessons regarding dangerous misprints would have been learnt by 1716, but no. In this year James Blow of Belfast published the first edition of the Bible to appear in Ireland . Unfortunately, in Isaiah ‘Sin no more’ appeared as ‘Sin on more’. No error was discovered until a number of copies had been issued and bound. The 8,000 or so sheets containing the mistake had to be cancelled and new ones printed. Few copies could have escaped capture, because I can’t find a single one for sale online. Perhaps Dr Ian Paisley has a copy. John Field, the famous Puritan printer, is said to have received £1500 from the Independents as a bribe to corrupt a text which might sanction their practise of lay ordination. Thus in Acts vi 3 ‘ye’ is changed to ‘we’ in several editions of his Bible. The verse reads: ‘Wherefore, brethren, look ye among the ye seven men of honest report, full of the Holy Ghost and wisdom, whom ye may appoint over this business’. Synchronicity - I just read The Club Dumas, a mere decade... and more... after seeing the movie. Excellent book. Is'nt there a story that the proofs of Lady Maxwell's biography of her late husband, Capn Bob, describe the loss of her virginity on her wedding night as a "...painful fist experience.."? Or is this Apocro Phil? The proofs of a private press catalogue issued by a London bookseller for whom I once worked included a number of items printed at the Rampant Loins Press.